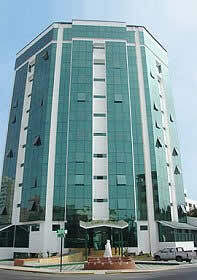 Miraflores Colon Hotel invites you to spend pleasant moments in your stay. Our Hotel is strategically located in the central district of Miraflores, with quick access to major tourist attractions, recreational, commercial and financial. Easy location 30 minutes from the airport. Room with king size bed, carpeted, bathroom with whirlpool tub, refrigerator, telephone with national and international direct dial, fire detector, air conditioning, TV with cable. Room with two double beds or a king size bed, carpeted, bathroom with whirlpool tub, refrigerator, telephone with national and international direct dial, fire detector, air conditioning, TV with cable. Room with king size bed, carpeted, bathroom with Jacuzzi, minibar, telephone with national and international direct dial, fire detector, air conditioning, TV with cable. Room with king size bed, carpeted, bathroom with shower and jacuzzi Spanish, direct dial telephone with national and international fire detector, Kitchenette, Living room, minibar, air conditioning, TV with cable. Room with three double beds, carpeted, bathroom with whirlpool tub, refrigerator, telephone with national and international direct dial, fire detector, air conditioning, TV with cable. Our Hotel is strategically located in the central district of Miraflores, with quick access to major tourist attractions, recreational, commercial and financial. Easy location 30 minutes from the airport.